The overall flood situation in the State of Assam remained grim with the number of affected people going up to more than 2 million people. The death toll in the current wave of floods also increased to 13. The rail and road communication all over the State have been badly affected with floodwaters inundating national highways and railway lines. According to official reports, the current wave of floods have so far affected 2794 villages in 19 districts of the State and about four lakh (400,000) houses have been damaged. The floods have also caused heavy damage to standing crops and as per reports available, more than four lakh hectares of cropland has been affected so far. Due to inundation of the railway tracks, trains are being run through the South bank of the Brahmaputra and the Fakiragram-Guwahati and New Bongaigaon-Guwahati passenger trains have been cancelled. Governor Ajai Singh and Chief Minister Tarun Gogoi today visited the flood-affected areas of Kamrup district to take stock of the situation. The Union Minister of State for Defence Bijoy Krishna Handique today met Prime Minister Dr Manmohan Singh and requested him to send all possible assistance to the State Government to deal with the situation. 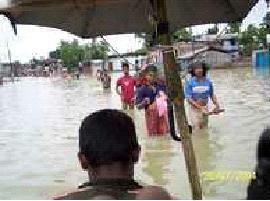 The floodwater in the Barak River was flowing at 2 meters above the danger mark in the silchar area on July 22, 2004. The flood situation in the three Barak valley districts remains grim with the water level of the rivers Barak, Katakhal and Dhaleswari flowing above the danger level. More than two lakh people of the valley have been affected and rail and road communication to the valley remain cut off. Three persons were reportedly buried in landslide at Sonapur yesterday.